This is a serious pro-standard amp with a price to match. However, what gives the Superdrive its edge over the competition is the sheer quality of the sound - few amps sound this good over such a wide volume range. Superb tone at ear-splitting volume. Easy to dial in. Built to a very high standard. Minor construction niggles that should be taken care of at this price. What gives Budda gear its edge over the competition is the sheer quality of the sound. With effects loops and slave ports, you've got all the spec you need. Red devil valves lurk behind the mild-mannered grille. The Superdrive 80 is a power-packed machine. Budda´s distinctive black and purple amplifiers have been with us for years now, and the crisp tones of these hand-built Californian designs have gathered a small but loyal following in the USA. Now upgraded to Series II status, the Superdrive 80 is the top of the range: a hard-hitting quad 6L6-powered head intended for big stage use, with volume and clarity to dominate large concert halls or even outdoor festivals. The Superdrive 80 is a good-looking head, if a little on the chunky side, using the less common ‘upside-down´ configuration - the chassis is slung from the top of the head box by four bolts, with the valves pointing downwards. To combat the less effective cooling of this type of design, there´s a small fan bolted to one end of the chassis, which blows across the Superdrive´s matched quartet of GT6L6 output valves to keep the temperature under control. The cabinet construction is clean, although some details fall short of the standard we´ve seen on other Budda amps in the past. The corner radiuses aren´t as smooth as they could be on this sample, and the rear panel cover could do with being supported by battens on all four edges to add a bit more rigidity. These minor niggles aside, the woodwork is certainly tough enough to cope with non-stop touring and so is the substantial aluminium chassis, which has welded corners and a separate base plate fixed to the cabinet to create a totally screened enclosure. The Superdrive´s electronics are a mixture of old and new. A large but simple printed circuit board holds most of the components including three preamp valve bases, smoothing capacitors and front panel controls, with a second small PCB for the rear panel slave output and level control. Other components, including the output valves and power supply diodes, are wired point-to-point for reliability and ease of servicing. The main PCB is double-sided, through-plated and adequately supported by 14 metal stand-offs. These are quite tall, and consequently the preamp valves are deeply recessed. Unless you remove the chassis, the valves are difficult to grip and you can´t see to line up the pins with the socket - it would be a pain to replace a bad preamp tube on this amp in the field. The wiring is carried out to a good standard, with twisted and plaited leads to the transformers, although it´s not as tidy as we´ve seen on previous Buddas. Boutique amps often have control panels that throw new users a curve ball or two. 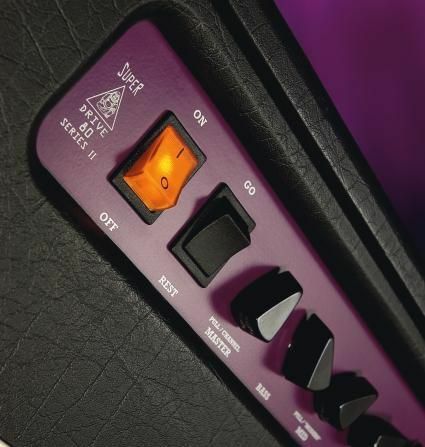 Thankfully, despite purple anodised faceplates and triangular knobs, the Superdrive 80 isn´t one of them - this is a straightforward two channel design using separate gain controls for rhythm and drive, teamed with a shared master volume and tone stack. There´s a pull-bright switch on the rhythm gain control and a pull-modern switch on the mid pot - this widens the frequency sweep for a slightly more exaggerated scoop effect if you turn the mids to zero. The master volume includes a pull switch for changing channels if you don´t have the footswitch to hand. Around the back, there´s a slave output with vari-level control, a pair of send/return jacks for the series effects loop and an impedance switch for the speaker outlets. There is no means of disabling the cooling fan or adjusting bias voltage for the output valves - Budda presets this at the factory and as long as you keep to the same type and grade of Groove Tube, you can expect consistent performance. The Superdrive range is well known for its ‘Plexi´-inspired, harmonic-laden tones, and plugged into a Greenback-loaded 4 x 12, this head certainly makes all the right noises. The rhythm channel´s gain range is particularly well judged, going from a rich clean sound at lower settings to the kind of bark that would make a well-trained Rottweiler jump. Set around the halfway mark, you can easily back off on the guitar´s volume for clean rhythm sounds or turn up to add grit, making this channel very versatile. The drive channel is excellent, with a tightly defined midrange and crisp highs that make those ‘side of the pick´ harmonics easy to pull out whenever you want them. Many ‘Plexi´ users plug a good distortion pedal between guitar and amp to get their tone really cooking, and the Superdrive´s lead channel gives you that sound straight out of the box. The modern ‘scooped´ tone is easy to dial in too; just set the mids to zero with the pull switch out, and you´ve got that sound lusted after by most modern rock players, with more than enough gain and distortion to cater to all manner of tastes. vintage PAF-style humbucker, delivering a near-perfect balance between midrange punch and treble definition. Mains hum is virtually non-existent, although the downside of the lead channel´s high gain and enhanced treble response is a slightly elevated hiss level that some might find intrusive at lower volume. However, bear in mind that this particular model isn´t really a sensible buy for bedroom heroes. With the master wound up, the Budda´s dynamic punch and clean headroom easily matches the established top guns in this genre with a sweet treble response that makes it a lot easier to listen to than some of the competition. Occasionally we would get a pop from the relay when changing channels, but to dampen that would probably sacrifice some of the Budda´s tonal purity - on balance it´s something we´d be prepared to live with. It's worth noting that unlike many channel-switching high gain amplifiers, straight out of the box it's not always easy to achieve a useable clean/dirty level balance for live use, although the official Budda website carries details of a simple wiring mod that can be performed to even out the relative channel levels.